Three years ago this December, Blue's twin sister, Iris, died in an accident, and nothing has been the same since. Blue's parents pack their work schedules with lots of international travel so that they don't have to be home. Flora, Blue's older sister, has developed a flair for the dramatic, complete with colorful hair dyes and a new boyfriend. The younger siblings, Jas and Twig, like their new Bosnian au pair, Zoran, but they find him an unacceptable replacement for the constant presence of their mom and dad. 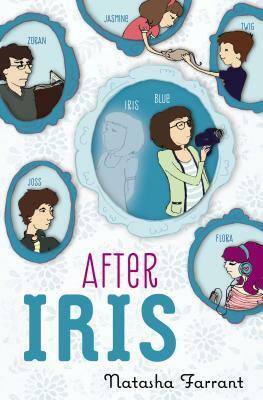 And Blue has become a shadow, hiding behind her video camera and observing the world, but rarely engaging with her classmates, or the friends who knew her when Iris was alive. Something has to change, and everyone knows it, but who will make the first move? When I first heard about this book, I was drawn to it, but also wary. I tend to avoid "death books" because they often upset me far more than they should, causing me to lose sleep and feel generally uncomfortable for a long time after I finish them. I was worried that this book would take place quite literally "after Iris," thinking that perhaps the story might even begin with her death. My expectations, as it turns out, were quite shortsighted, and what I found in this book was not morbid despair, but a hopeful optimism, as Blue and her family slowly learn how to move forward with their lives without forgetting the person they loved and lost. This is a beautifully written middle grade debut, which stands out because of its unique writing style, its quirky characters, and its focus not just on losing a sibling, but on coming together as a family. The chapters alternate between Blue's video diary, which includes transcripts of various moments she has caught on film, and her written commentary on her family, friends, and school life. Blue is a quiet, introspective character, but her subdued personality is complemented wonderfully by the big personalities of the rest of the kids in her family. Though the main plot is always about Blue trying to integrate back into her life in the absence of her twin, subplots about a community theater production, Zoran's own troubled past, and the younger siblings' rats provide action, drama and humor where otherwise Blue herself is very passive. The family in the story - as well as the author herself- are British, and at least partly because of that, this book kept reminding me of Hilary McKay's novels about the Casson family. The only Casson story I've read myself is Saffy's Angel, in which Saffy learns she is adopted, and I noticed a lot of similarities between Saffy and Blue, from their clueless parents to their own pain and isolation. The relationship between Blue and Flora is also reminiscent of the sisterly relationship among the girls in the Sisters Club books. The blurb on Goodreads also draws comparisons between After Iris and The Penderwicks, but I'm not sure Penderwicks readers, who are used to light neighborhood adventures, would necessarily be drawn to this deeper story about love, loss, and moving on. All in all, though it is difficult to describe this quiet novel, it is definitely worth reading and sharing with sophisticated readers of middle grade realistic fiction in grades 4 to 8.